I wasn’t sure what to expect from Off to Be the Wizard. 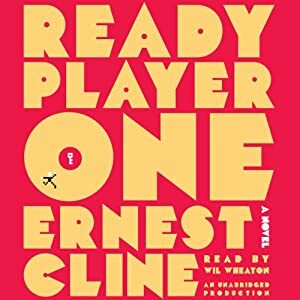 The 8-bit artwork on the cover and the fact I recently re-listened to Ready Player One had me in a certain mindset that didn’t match this story at all. But just a little ways into this book I found myself really enjoying it. And the more I listened the more I liked it. By the end of the book I was cheering and laughing out loud. Luke Daniels does a fantastic job bringing the characters to life and giving each one of them a unique voice. The entire story is full geeky goodness with pop-culture references throughout along with plenty of dry humor. I can’t wait to listen to Spell or High Water the sequel to Off to Be the Wizard. 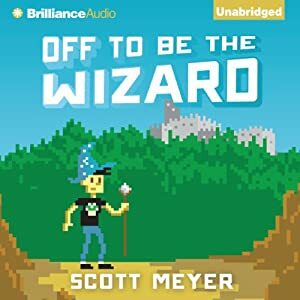 I rate Off to Be the Wizard a 9 out of 10 and recommend it to anyone looking for a fun geeky comedy. 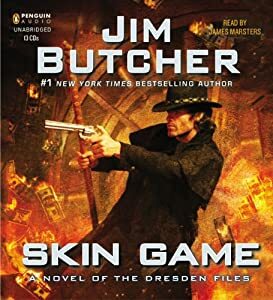 Skin Game is the 15th book in the Harry Dresden series and James Marsters turns in another amazing job with the narration. I enjoyed the whole breaking into the vault part of the story, but the rest of it left me a little dry. It s a good story, but it doesn’t rise to the kind of greatness that I have come to expect from the Desden series. Having said that, I am on the edge of my seat waiting for the next book in the series. I rate Skin Game 7 out of 10 and recommend you read Storm Front and the other Harry Dresden books before this one. I absolutely love this audiobook, I think this is my third time listening to it. The combination of Ernest Cline’s writing and Wil Wheaton are an amazing geeky combination of greatness. A co-worker recently commented that Ready Player One was pandering to geeks like me, my response was that I DON’T CARE! If I could get more people to pander to me the way this book does my life would be wonderful. If you are a geek of the 80’s you NEED to read or listen to this book ASAP. I rate this book an 11 out of 10 and recommend it to all geeks and nerds. 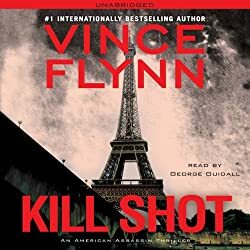 After finishing American Assassin I jumped straight into Kill Shot: An American Assassin Thriller to continue with the Mitch Rapp series. I really enjoyed the first book and I think this second one is even better. There is more spy-like action with double-crossing and backstabbing. What I liked most about this story is that the ancillary characters are well fleshed out and I found myself caring for them and excited about their part in the story. I would love to read a series of books with the lead police detective from Paris as the protagonist. George Guidall does a great job reading the book with his usual fatherly pace and timbre. #1 New York Times best-selling author Vince Flynn is back with another nail-biting political thriller that follows the young Mitch Rapp on a deadly mission to hunt down the men responsible for the Pan Am Lockerbie terrorist attack. The next morning, the news breaks in Washington that Libya’s Oil Minister has been killed along with three innocent civilians and four unidentified men. The French authorities are certain that the gunman is wounded and on the loose in Paris. As the finger pointing begins, Rapp’s handlers have only one choice – deny any responsibility for the incident and pray that their newest secret weapon stays that way, avoiding capture and dying quietly. One person in the group, however, is not prone to leaving things to chance. Rapp has become a liability, and he absolutely cannot be allowed to be taken alive by the French authorities. But it will soon become clear that nothing is more dangerous than a wounded and cornered Mitch Rapp. I rate Kill Shot a 7 out of 10 and recommend to fans of spy thrillers. 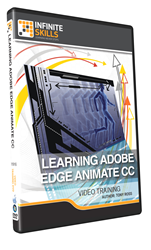 Learning Adobe Edge Animate CC training video from Infinite Skills Inc. featuring Tony Ross is a great place to start learning Adobe Edge Animate. I found Tony’s voice easy to listen to, his explanations easy to understand, and the video of the computer screen easy to read and follow. Half way through the video I built my first animation, it’s good stuff. Edge Animate has a lot of problems as an application, it is definitely going to improve as new versions are released, and this video does nothing to highlight those problems and steer you clear of them. But the video is definitely worth watching closely. You can learn about the bugs and limitations somewhere else. I think Tony Ross and Infinite Skills did a great job making a training video that can get anyone familiar with other Adobe applications up and running in Adobe Edge Animate. I rate Learning Adobe Edge Animate CC an 8 out of 10 and recommend it to anyone looking to learn how to use Adobe Edge Animate. Posted in Computers. Tagged Adobe, Animate, CC, Edge.